This simple fly was given to me by a Friend on an outing to a Midlands Stillwater. He claimed that it was his favorite Yellow fish Fly. I have since been extremely successful fishing this fly in rivers and dams for both Yellow's and Trout. My personal best rainbow 2.2 Kg was taken on this fly on still waters. 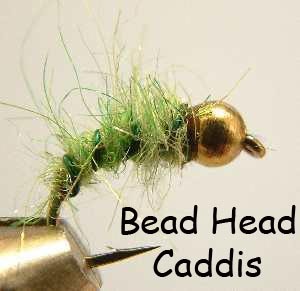 Dress the hook with thread behind the eye until the bead sits snug. Seat with a drop of super glue. Tie in the Rib right back to 1/3 into the bend of the hook.